The club had it's opening day on Saturday 16th April this year, and boy were we lucky with the weather. The green and the flower beds sorrounding it were looking great. Big thanks to Jim and Bill for that! The inside work done is also greatly appreciated, especially the new floor covering in both the main clubroom and the ladies' changing area. There was a good turnout of members for the annual President v Vice President match, thirty two, and I am pleased to announce that we had a very close game indeed with the President's team just edging it with 55 to 53 shots. The winners of the sweepie were Doreen Myles and George Henderson. 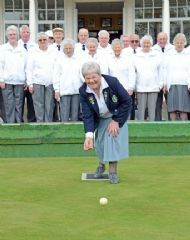 Our lady President Frances Stott once again rolled the first Jack and as usual she won the end. Thank you Frances and hope your back improves soon! Don't forget we have our first Coffee Morning at the Old Church on Saturday 23rd April between 10 and 12 o'clock. All the usual stalls and of course the wonderful tea/coffee and cakes served by our first class members on duty!